Servants are Heroic Spirits that you, the Master, command in Battle. Servants are primarily obtained via summoning. 0-3★ Servants can be summoned from Friend Point Summons, and 3-5★ Servants from Saint Quartz Summons. Some Servants can be obtained as special rewards during events or as a reward for completing main story chapters. There are currently 241 Servants, of which 90 are limited or unobtainable, either because they are only obtainable as event rewards, or they are only available at limited times. Craft Essences are equipped to Servants in the Party and Support screens to provide additional stats and effects. Saint Quartz (6-9), and Bond Craft Essences (10). 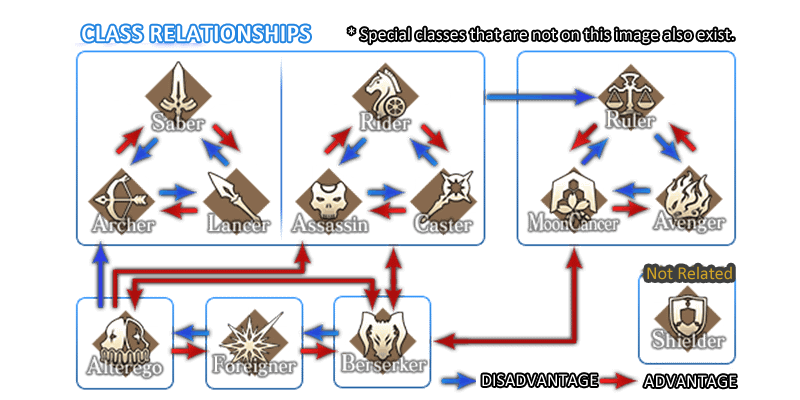 Beast I (Goetia) and Demon Pillars are strong against Knight classes and weak to Cavalry classes. Beast II (Tiamat) and Corrupted Ushiwakamaru are functionally the same as the Shielder class. Beast III/R (Heaven's Hole) attacks neutral to all classes, but takes additional damage from Alter-Ego and Mooncancer.